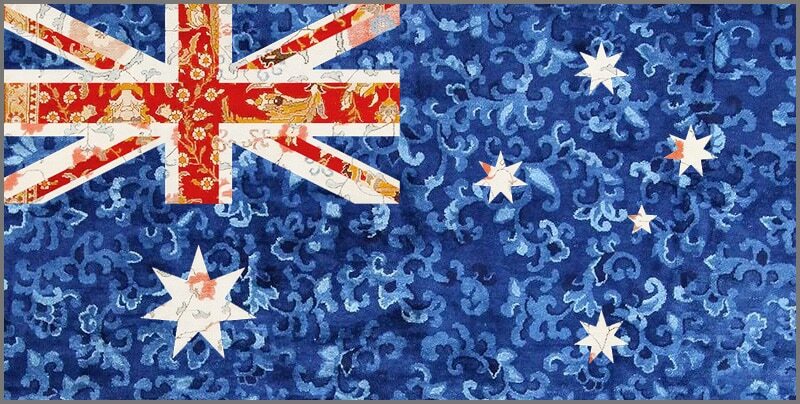 The Australian continent is home to some of the savviest appreciators of antique rugs in the world. For a long time, Nazmiyal Antique Rugs has been selling some of our best antique rugs and carpets to clients all over Australia. Interior decorators and rug buyers in cities such as Melbourne, Sydney, Perth and Brisbane have been keeping us pretty busy. The main reason why people who are looking for good antique rugs in Australia come to us is because the pickings are pretty slim in the land down under! While there are some rug and carpet dealers in Australia, they almost exclusively deal with more commercial and modern new rugs and not one will have the comprehensive antique and Persian rug inventory that we have in our NYC, USA location. Australia, the official title is the Commonwealth of Australia, is a sovereign nation which occupies the entire Australian mainland, the island of Tasmania and various other islands. It is the biggest nation in Oceania and the world’s 6th most prominent nation regarding landmass. The neighboring countries are Papua New Guinea, Indonesia and East Timor toward the north; the Solomon Islands and Vanuatu toward the north-east; and New Zealand toward the south-east. The 25 million populous is very urbanized and primarily inhabit the eastern seaboard. The capital of Australia is Canberra, and its biggest city is Sydney. The nation’s other significant metropolitan regions are Melbourne, Brisbane, Perth, and Adelaide. Indigenous Australians occupied the continent for around 60,000 years before the British settlement in the late eighteenth century. It is a fact of research that Aborigines talked dialects that can be divided into approximately 250 gatherings. The Europeans arrived on the mainland in 1606. They were Dutch voyagers who named the island New Holland. Australia’s eastern half was asserted by Great Britain in 1770 and was initially settled through reformatory transportation to the state of New South Wales from 26 January 1788, a date which turned into Australia’s national day. The populace developed gradually over the upcoming decades. By the 1850’s the majority of the landmass had been investigated, and an extra five self-governing states took form. On 1 January 1901, the six settlements combined, shaping the Commonwealth of Australia. Australia has since kept up a liberal based political system that operates as a government parliamentary monarchy, containing six states and ten regions. Being the most established, flattest and driest possessed mainland, with the least fruitful soils, the Australian country has a landmass of 7,617,930 square kilometers (2,941,300 sq mi). A mega-diverse nation, its size gives it a wide assortment of scenes, with deserts on the inside, tropical rain-forests in the north-east and mountain ranges in the south-east. A gold rush started in Australia in the mid-1850’s, which supported the number of inhabitants in the nation. In any case, its populace is still among the most minimal on the planet. Australia produces its pay from different sources including mining-related commodities, media communications, banking, and industrial might. Indigenous Australian artistry is the most established and most extravagant on the planet, dating as far back as 60,000 years and spread over a vast number of locales. Australia is an exceedingly developed nation, having the world’s thirteenth biggest economy. The economy boasts the world’s tenth richest per capita pay scale. It is a provincial power and has the world’s thirteenth most astounding military use. It also has the world’s ninth largest foreign population, with immigrant workers representing 26% of the populace. The country has the third-most noteworthy human improvement index and the eighth-most productive democracy. It nation scores profoundly in personal satisfaction, well-being, instruction, financial opportunity, universal freedoms, and political rights, with all of its significant urban communities faring admirably in worldwide quality of living reviews. Australia is a participant in the United Nations, G20, Commonwealth of Nations, ANZUS, Organization for Economic Co-task and Development (OECD), World Trade Organization, Asia-Pacific Economic Cooperation, Pacific Islands Forum, and the ASEAN Plus Six system. So for all the the savvy people who are shopping for carpets and antique rugs in Australia, you may want to give us a shot. We at Nazmiyal Antique Rugs in New York City, are sure to have a larger inventory and far better prices for antique carpets and Persian rugs than you would find anywhere in the entire Australian continent.